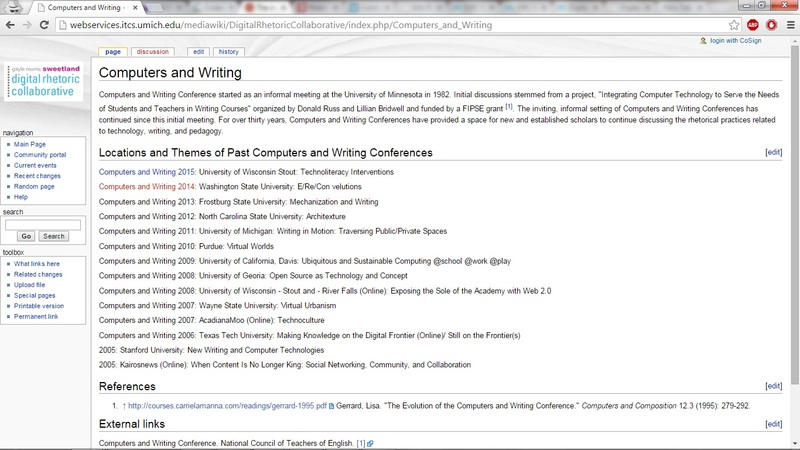 We previously reflected on the DRC Wiki Quest at Computers and Writing 2015 and met grand prize winner Stephanie Vie. 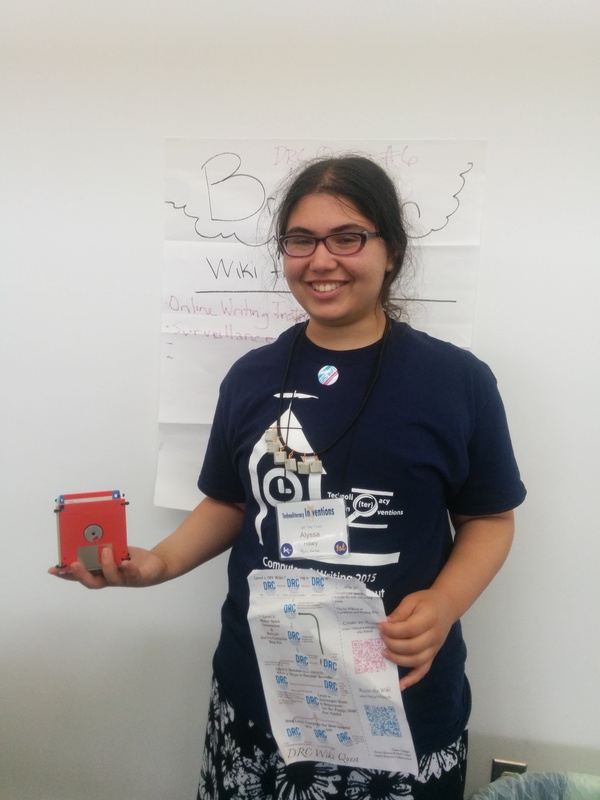 This week, meet DRC Wiki Quest grand prize winner Alyssa Hillary! 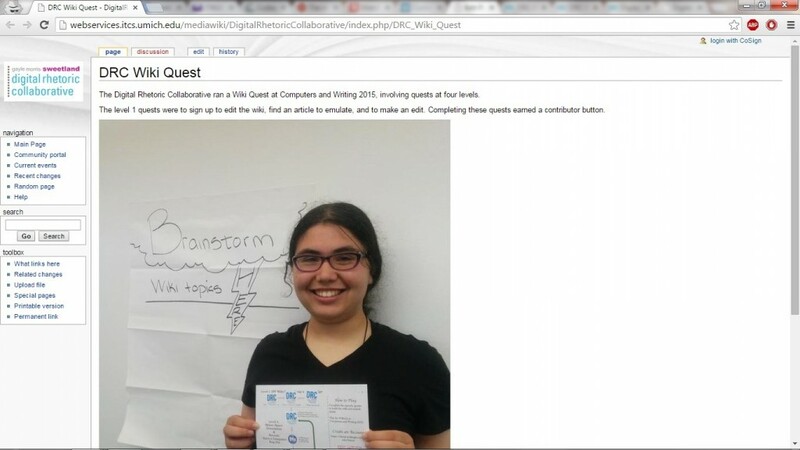 Alyssa was the first to complete the DRC Wiki Quest at Computers and Writing 2015. We offer congratulations to the three grand prize winners, Alyssa Hillary, Stephanie Vie, and Shelley Rodrigo, who completed the steps in the DRC Wiki Quest, and all the other questers who participated in the DRC Wiki Quest and helped collaboratively build the resources of the DRC Wiki. Meet DRC Wiki Quest winner Alyssa Hillary, who won as a grand prize a copy of Rhetoric and the Digital Humanities by Jim Ridolfo and William Hart-Davidson. It was there, and there were prizes, so I looked. Then the part where I think wikis are important kicked in. I made a page for a session (D5: Disability and Universal Access,) which I later reviewed for the DRC, though I used my notes and that page as a reference in my review. I also started adding a list of previous conference locations and themes to the Computers and Writing wiki page and made a page for the Wiki Quest, which as of my writing this still only has a statement about the level one part of the quest and the aforementioned picture of me. You need to make an account first, but editing the wiki is something you can learn fairly quickly by doing it, so don’t be too afraid. Also, there’s plenty in need of being added, so have at it. …editing the wiki is something you can learn fairly quickly by doing it, so don’t be too afraid. Also, there’s plenty in need of being added, so have at it. We look forward to seeing more contributions from Alyssa Hillary!